Northern Idaho and surrounding areas of Washington and Montana are blessed with a great variety of both flora and fauna. The southern edge of the boreal forest, the Rocky Mountains and inter-montane habitat types blend into one another into. Many species of migratory birds pass through the Idaho panhandle following Pacific flyway routes. Canada Geese, often called Honkers, are one of the most common. Large flocks settle on the lakes and rivers. Some Canada Geese are also year-round residents in the Sandpoint-Lake Pend Oreille area. The image below depicts some of them on Sand Creek just a short distance upriver from Sandpoint. While we do not seem to have suffered from a loss of birds that has plagued many part of North America I have noticed an increasing number of dead geese, and fish, in recent years while in my kayak. Whether that somehow results from the appearance of Eurasian Milfoil in out waterways, chemicals used to combat the infestation, construction and habitat degradation near the water, or some other factor, I do not know, but I worry about environmental degradation in this are as the population grows. I recently picked up a few tips that will allow me to become better at the mechanics of using 3D software to make art. Those tips are incorporated into this image; a mountain lake in spring. Sunlight reflects off trees in the distance in a more natural way that I was able to achieve previously. And I think I was able to render a fairly good approximation of ice as it appears on a lake in spring when it melts most days and then refreezes at night. And the partially-melted snow on the hills also looks natural. I added a Steller’s Jay (Cyanocitta stelleri) in the foreground as they are one of the most beautiful and interesting birds in the upper left hand corner of North America. We call them screeches as that is what they do. 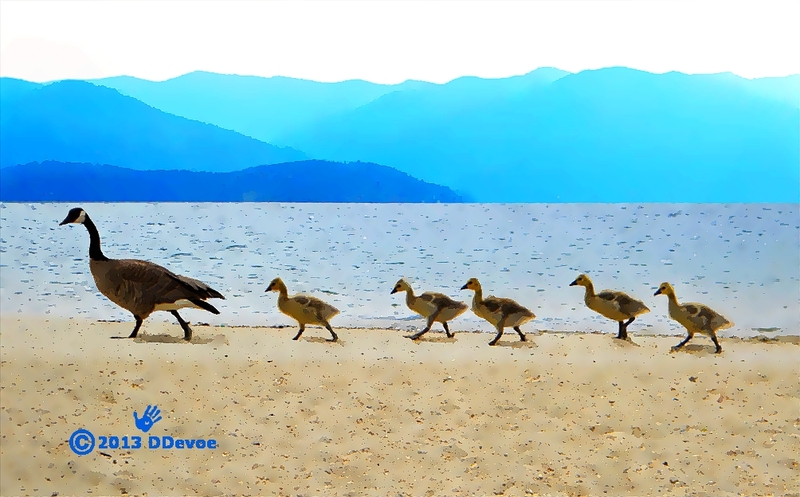 Canada Geese goslings are escorted along the shoreline of Lake Pend Oreille in northern Idaho by an adult; nice blue mountains on the other side of the lake. This is a typical scene at City Beach park in Sandpoint. 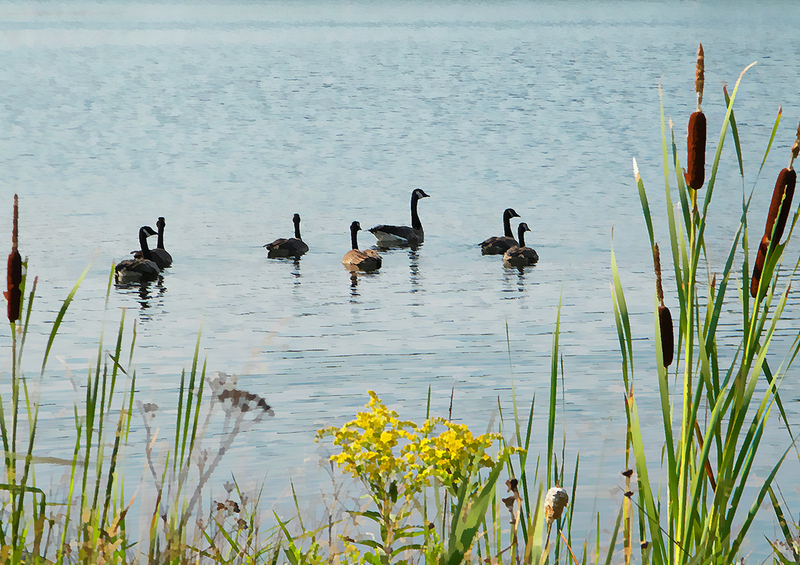 For many years there was a group of resident geese. The powers that be decided they had to go – too many droppings – despite protests. The geese were eliminated and, in my opinion, it was a loss to the town. Now, however, there is a new group of year-round residents. They are fairly tolerant of humans allowing for close viewing and photography. One of my favorite wildflowers because the color stands out against all the green this time of year. 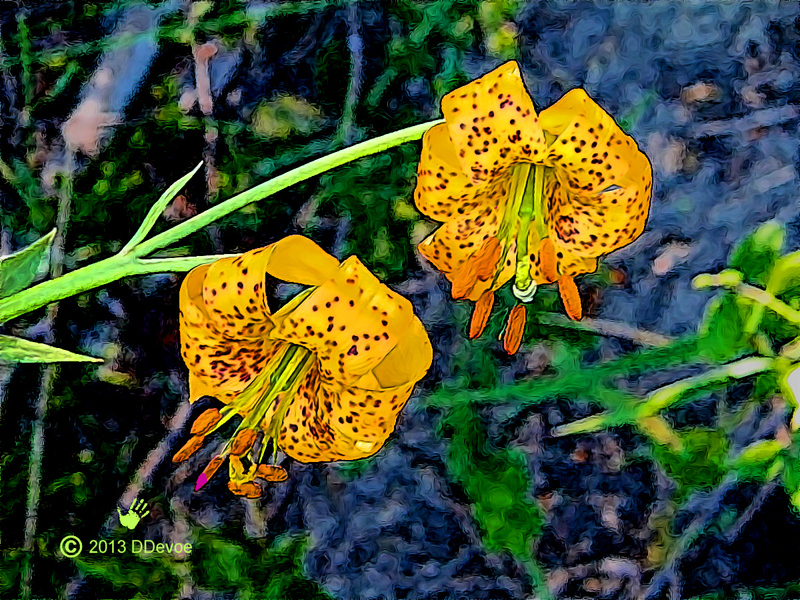 There are several species of lily species in North America which share the common name “Tiger Lily.” The species native to the Pacific Northwest and southern British Columbia (Lilium columbianum) is also known as the Columbia Lily, and the Small-Flowered Tiger Lily. The lightly-scented flowers can be yellowish, but are usually orange. The spots are a dark purple. 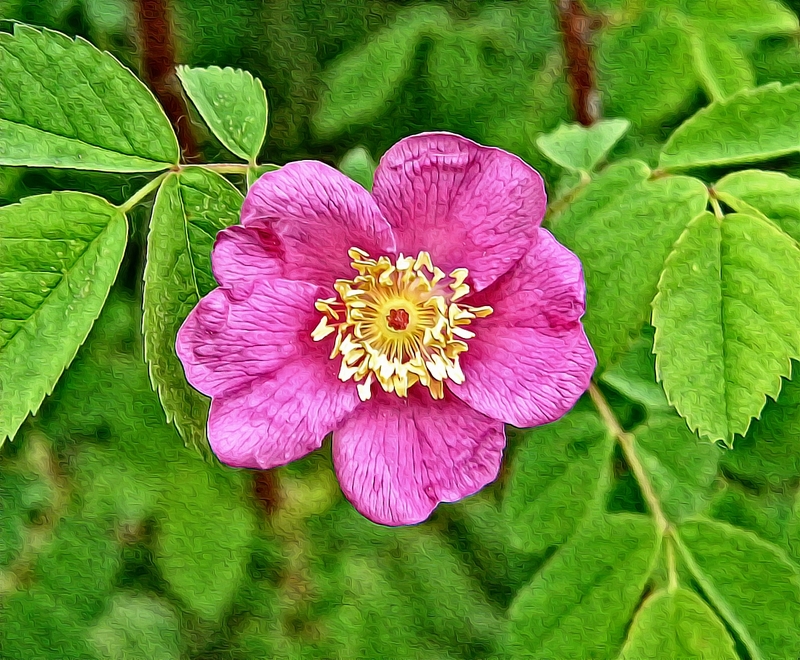 It can be found in drier coastal meadows, forests, roadsides, and subalpine meadows. Lilium columbianum occurs in open woods and forest openings from southern British Columbia south to northern California and east to Idaho, Montana and Nevada. 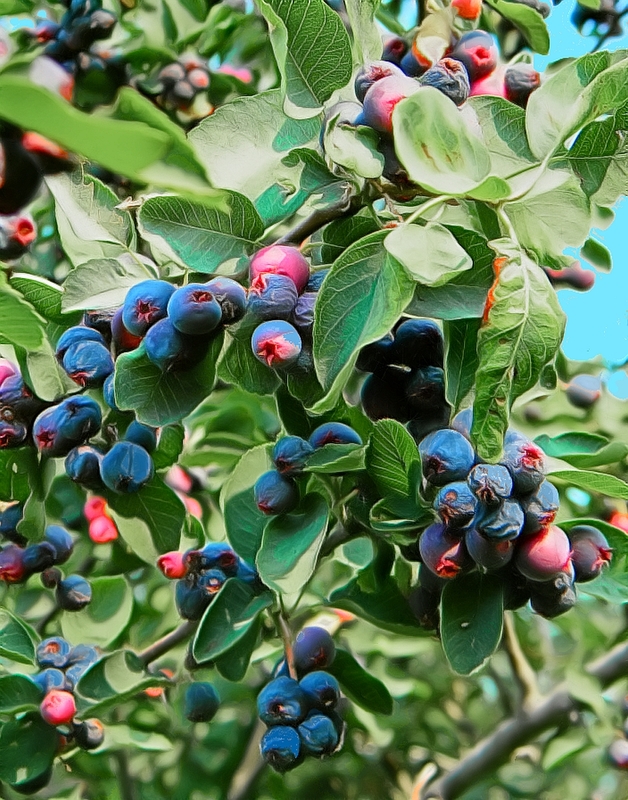 Several West Coast and Californian Native American tribes ate the species’ bitter or peppery-tasting bulbs. Dried Lilium columbianum is also eaten all around the world but it is not well known for it. Dried whole L. columbianum has a sweet and a sour taste. Unlike many native lilies, it is not particularly rare, but picking the flowers is discouraged as it impairs the ability of the plant to reproduce. that I pictured some time ago. Shown later in the year. A bit worse for wear as is evident, but with nice red berries. 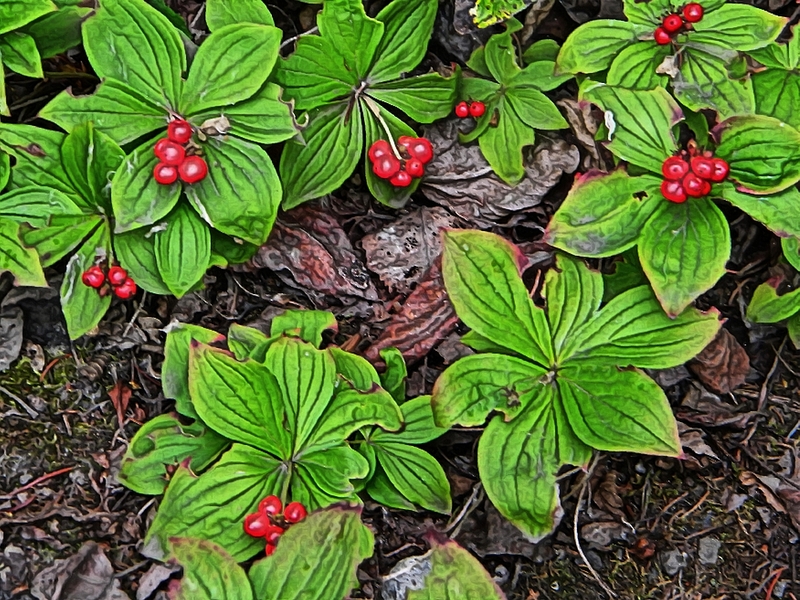 Bunchberry, along with a few others, such as Thimbleberry, Raspberry, Strawberry, Huckleberry, and Pacific Elderberry, are some of my favorite plants. 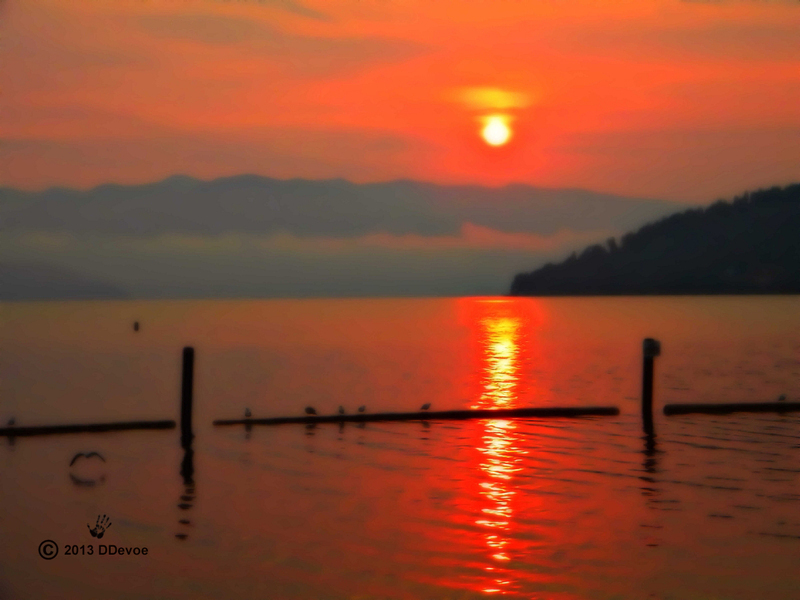 As usual, this image is available on a number of items at my Zazzle store.